Explore an African watering hole ... navigate the Great Barrier Reef ... discover a Giant Squid... come face to face with a jaguar... encounter life-sized dinosaurs... marvel at the diversity of birds and shells from around the world. These and many other discoveries await you at the Delaware Museum of Natural History. Highlights of the galleries include the Coral Reef Walkover, three-dimensional dioramas, the Science in Action lab, and the opportunity to explore habitats of nearby marshes and woodlands, far away jungles and the deep blue sea. Throughout the year DMNH also hosts three special exhibitions on national tour. Adjacent to the Dinosaur Gallery is the interactive Discovery Room, a place where children of all ages can play, see and do. The Discovery Room features fun, hands-on science activities where budding paleontologists can examine genuine dinosaur fossils, future marine biologists can explore a coral reef, and curious kids of all ages can gaze at intricate mineral crystals or tiny insects under a microscope. In addition, visitors can view nature films in the DuPont Auditorium, shop in the Museum Store, enjoy the butterfly garden, or walk along the Larry Scott Nature Trail. The Delaware Museum of Natural History invites you to explore the wonders of the natural world. Open during museum hours, the shop offers educational and entertaining natural history items including books, kits, games and souvenirs for all ages. Also available are nature-related gift items including jewelry, art and decorative objects. 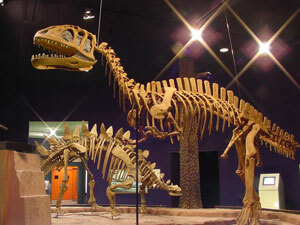 The Delaware Museum of Natural History is located on Del. Route 52 (Kennett Pike) five miles north of Wilmington, Del.